Dr. Avitzur will be directing the Electronic Office Program at the AAN's 2004 Eastern Winter Conference in the Bahamas, February 13 to 15. The survey results, reported in July by the Pew Internet and American Life Project, showed an increase in the number of patients seeking online medical help. The survey indicated that 80 percent of adult Internet users, or about 93 million Americans, have searched for at least one of 16 major health topics online. Moreover, among that group, 58 percent said they first go online when they need reliable health information, compared with 35 percent who said that their initial move is to contact a medical professional. Indeed, according to Vital Signs: e-Health in the United States, a report released last January by The Boston Consulting Group, a management consulting firm, our patients are most likely to search the Web, visit online support groups, and come to the doctor's office requesting specific treatments and asking to enroll in clinical trials. The report found that patients with multiple sclerosis (MS) are among the most active neurology patients online. MS patients go online for medical information an average of 20 times per year – compared with nine times per year by the average patient with chronic disease. They are five times as likely to participate in forums or chat sessions, and one-third have requested a specific prescription medication from their doctor. 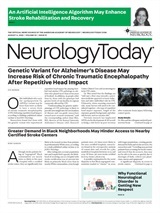 To consider the impact of this trend on the physician-patient relationship, Neurology Today spoke to neurologists and online experts. More patients are apparently bringing the fruits of their online research to their doctors' offices. ‘A half dozen patients came in this week alone with information they found on an investigational MS drug, alemtuzumab (Campath),’ said Brian R. Apatoff, MD, PhD, Director of the Multiple Sclerosis Clinical Care and Research of New York Presbyterian Hospital Weill-Cornell Medical College. ‘Patients frequently bring information they have found on drug company-sponsored Web sites,’ he said. ‘In most cases, these sites appear to provide balanced information, but I am concerned that some bias may be introduced. So I tend to direct patients to the National MS Society Website, www.nmss.org, or to WebMD, www.webmd.com. ‘In some cases, a patient may find information that the physician must discuss, interpret or put in its proper context, such as an extensive list of potential side effects or erroneous information about a condition or treatment,’ Dr. Mauskop explained. In September, the Health Improvement Institute, in collaboration with Consumer WebWatch, published the first phase of a research project on informed use of Internet health information sites. It found that there are no criteria or assessment tools to evaluate health Web sites. It recommended that, until such tools exist, patients look for this among other information – who owns, sponsors, or funds the site; potential conflicts of interest; ease of navigation; and an indication of when the site was last updated. ‘Patients should use common sense,’ said online health specialist Tom Ferguson, MD, Senior Research Fellow at the Pew Internet and American Life Project and Editor and Publisher of The Ferguson Report: The Newsletter of e-Patients and Online Health (www.fergusonreport.com). ‘They should compare what several sites have to say on their topic of concern and be critical consumers … even the best sites may occasionally offer less-than-perfect information. ‘The Internet is an open-source system,’ Dr. Ferguson said. ‘Anyone and everyone can contribute. So there will always be inaccurate, self-serving, or outdated information available. Yet open systems have their own unique quality control resources. Among the most important of these are the smart patient, both lay and professional interactive resources, and the tendency of patients to review and compare many sites rather than taking the information at any particular site as the gospel. ‘A patient with epilepsy, for example, can read the medical literature, consult an online support community, or e-mail a distant specialist,’ he continued. ‘They can even put up a Web site to share their experiences and to provide links to their favorite online resources for that condition. So if they come across sites providing outdated information or making unrealistic claims, they are Net-savvy enough not to get themselves in trouble as a result. ‘But if a patient is elderly, debilitated by illness, or not up to speed with online technology, physicians can try to help their patients understand the basics about their disease,’ Dr. Ferguson said. He noted that often younger, more Net-savvy children can help in their Web searches. Dr. Ferguson has been particularly impressed by the work of neurologist Daniel B. Hoch, MD, PhD, who helped develop PatientWeb.net, an online community used by patients of the Massachusetts General Hospital Epilepsy Service. Dr. Hoch's three-year experience with PatientWeb has shown him the unique value of online support groups for patients with neurological disorders. He advises fellow neurologists to develop innovative ways to harness the power of the Internet – rather than treat it as an unwanted intrusion such as direct-to-consumer marketing. ‘Some neurological patients need more support and guidance than they can get from an occasional clinical visit,’ he said. ‘But when their doctors direct them to non-profit, non-commercial sources of Web-based information, our studies show that patient satisfaction is greatly increased.